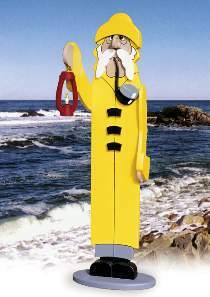 Standing over 5 feet tall and wearing a bright yellow raincoat, this salty mariner will be the highlight of your lawn, garden, deck or patio. He holds his lantern out in front in the manner you would expect on a foggy early morning. You can electrify his lantern by adding a wiring harness with frosted flame tip bulb. Patterns drawn FULL SIZE. Mariner Hardware includes lamp socket with 6’ wiring harness, on/off switch, frosted flame tip bulb, brown plastic eyes and screw eyes. Project plan, wood and paint are not included. Order hardware parts package separately or save with the Special Offer which includes the plan and hardware.